It hasn't even been a week since the PS4's launch and there's already another update. The PlayStation 4's 1.51 system update is now live. While it's not nearly as expansive as the 1.50 day one update that made many PS4 features available, the 1.51 update is also required and improves software stability. It also refines the user interface by clearly indicating when a user downloads a game and a game patch at the same time. North American PS4s have automatic downloads of system updates enabled by default when the PS4 is in standby. For current PS4 owners, the system update should have downloaded for you already as long as your system is in standby. 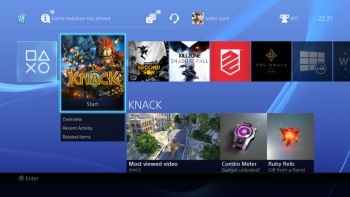 Smaller and more frequent updates may be what PS4 users will see as more of a normal occurrence. The ability for the PS4 to download updates while in standby, hopefully overnight while the majority of people sleep - although there are always still some people staying up late to play videogames - so that PS4 users don't need to be bothered to sit through the update. More frequent updates also allow PlayStation to respond to early consumer feedback of the company's newest console. There are bound to be many tweaks as the PS4 becomes more stable and more people buy it. Future system updates will add the support of major features such as wireless headset support and the suspend/resume function.